This is the perfect spot for a relaxing vacation at this private, third-story, beautifully-decorated, four-bedroom, four-bath villa with immaculate views of the ocean and the intercoastal waterway. New fllooring, HVAC and bedding 2017. Sleep 12 guests in the following bedding configuration: K, 2D, K, 2D The creative floor plan provides over 1700 square feet of easy living for up to 12 guests with each bedroom having its own private bath. The distinctive floor plan has a spacious living area which includes a comfortable sectional, large leather seat and a 40-inch flat screen TV w/ Netflix. 2 Blu Ray players. The four bedrooms are furnished with two king beds and four double beds. The master bedroom features a large walk-in closet and whirlpool tub. Take an approximately 150-yard walk to one of North Carolina’s most beautiful beaches or to the Islander Resort Beach Club with complete access to the ocean, an oceanfront pool, kiddie pool, hot tub, tiki bar, and the Isles Restaurant, featuring menu selections from hamburgers to a gourmet meal. You can also enjoy the beautiful sunsets on the spacious deck of this third floor villa equipped with outdoor resin furniture and a fully-equipped eating area. Ocean Isle Beach provides the perfect opportunity for a memorable beach holiday for everyone to enjoy! With spring and fall temperatures ranging from 75 degrees to the mid 80s, and the summer season reaching into the 90s, the area offers plenty to satisfy your need for sun and fun! Since historic Wilmington and the Grand Strand are within a short driving distance; you can take advantage of entertainment attractions such as the Alabama Theater and Alligator Adventure, historic attractions with tours of the USS North Carolina Battleship Memorial and Civil War forts, shopping at Chandler’s Wharf, Barefoot Landing, and Broadway at the Beach, fishing off the pier on the island or deep sea charters from area basins, and golf till you drop at 36 championship golf courses within ten miles. 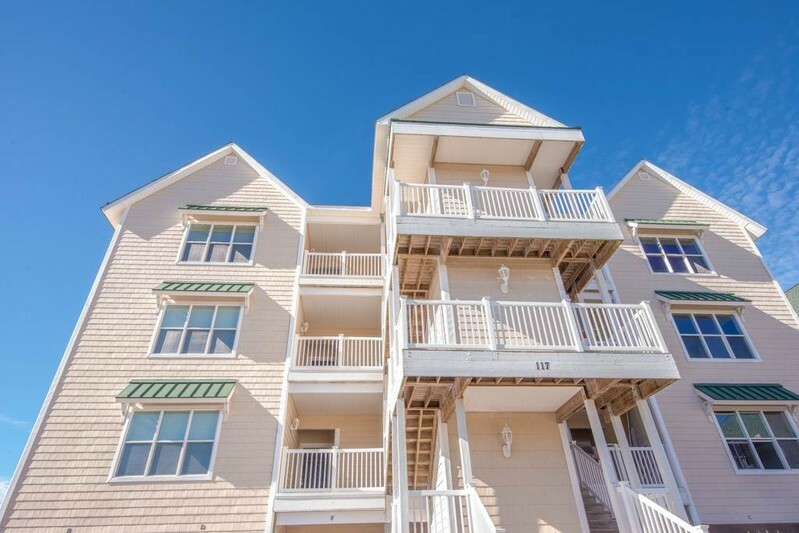 Experience the quiet of being on the third floor (with no noise above you) and unimpeded views of the Atlantic Ocean. (The villa is a quiet end unit.) The back porch affords you incredible views of the ocean, the sound, and the Intracoastal Waterway. Amazing Home! Must Visit and Stay! Upon arrival to this beautiful home were taken away at the views of the ocean and island. We were also ecstatic to see how family friendly Ocean Isle Beach was. We had plenty of information about restaurants, family fun activities, and shopping that was provided by the owners. This home has a spectacular view of the ocean and island anytime of the day (especially the sunsets on the porch). This home is in immaculate condition with plenty of space for your whole family with an extremely short walk to the beach and pool. You will find plenty of room around this home for entertaining in the kitchen, living room, and on the porch. You are only a few minutes away from small shops, restaurants, and family fun. Right outside there are plenty of tennis courts for you and the family to play and plenty of space to ride bikes, walk, run, and exercise. This home has everything you would want and need during your vacation. We highly recommend this home and will definitely be returning. This was a very nice place and we enjoyed our stay. There was a problem with the elevator, but we reported it and were told it would be repaired.